Hey everybody! So, when I was a kid, every summer my family would go on vacation. And on vacation we were allowed to pick out a "vacation present": ugly stuffed animals, weird snow globes, the millionth "Beach Patrol" hoodie - whatever we wanted (within reason). Actually, Jon and I seem to be on course for carrying on this tradition, as we both seem to return home from vacations with a new addition to either our sunglass, clothing or kitchen gadget collection. Anyway, I am almost finished writing my post about our recent vacation, eating out and rebounding from setbacks. I have a lot of information, frustrations, lessons, restaurants and stories to share with you, so it is taking me longer than expected, especially now that I've started training and studying for my Nutritional Therapy Practitioner certification, as I announced on Facebook earlier this week! Needless to say, there is a lot going on, but I refuse to let you leave the blog empty-handed! You didn't think I forgot about you while I was away, did you? To feel your absolute best, please try to adhere to the following guidelines: Avoid alcohol. Avoid caffeine (tea, coffee, soda, chocolate - green tea is OK). Drink at least 8 glasses of water. Avoid added sugar, processed foods, soda, etc (remember, this is a whole food detox, don't sell yourself short!) Get your body moving - a long walk, yoga class, sprints in your neighborhood- just get your blood pumping and the sweat rolling. Sleep 7-9 hours each night. 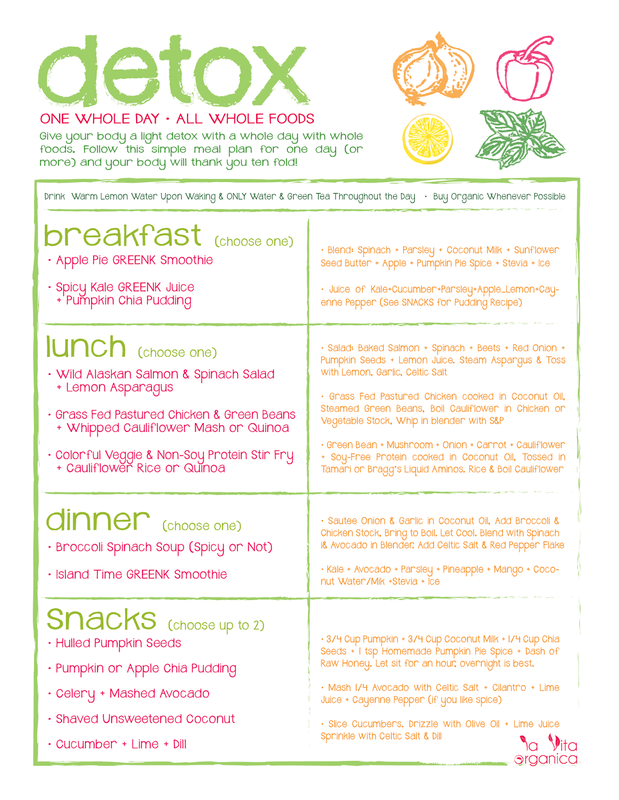 I hope this mini detox plan leaves you and your body feeling awesome! If you have any questions about the plans, recipes, or substitutes for any dietary/allergy restrictions, please feel from to message me either here on the blog or over on my Facebook Page! I'm always here to help! 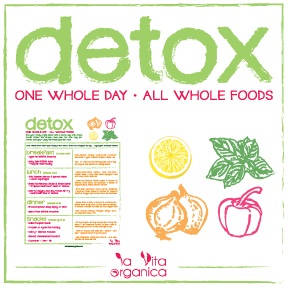 COMING SOON: La Vita Organica Video Q&A ! !